The cistern is the central part of our fresh water management, it stores the winter rainfall that is collected trough out all hard surfaces like roofs, verandas and stairs that we created through out the building process. This area ads up to 281 sq m with an average 380 mm of annual perception (rainfall) the water that will be collected is around 100.000 L (100m3). This amount of water can provide all needs of the Ecolodge trough out the 4 dry Summer months. In August the excavation started(pic.1) and we extracted about 30% of the stones we used for our buildings. After leveling the ground the wood shuttering for the concrete was put up(pic.2). 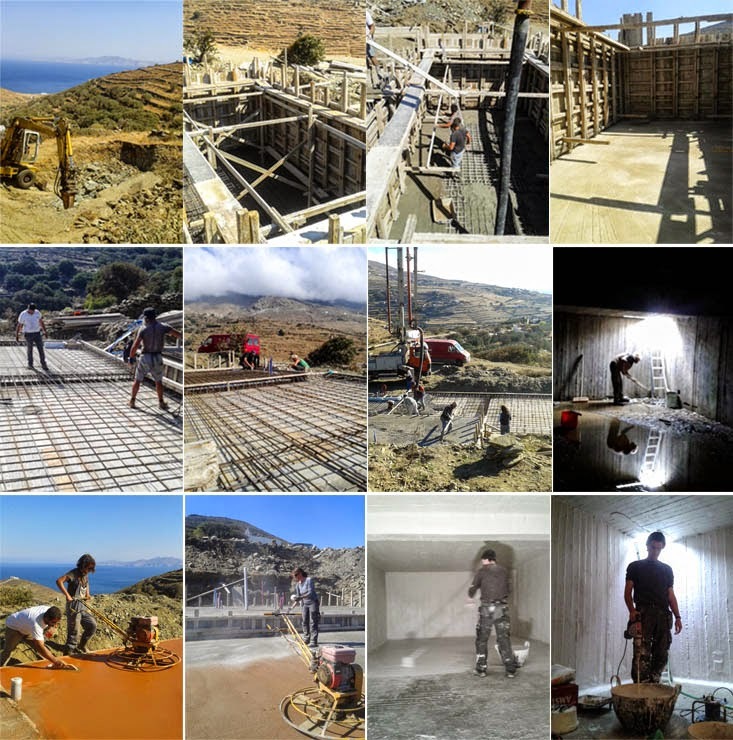 Concrete was poured in September and the Greek magicians managed to make floor and walling in one run(pic.3-4). Iron reinforcement was put in place for the roof that also is making up the veranda of the one house(pic.4-6). Cleaning out all the mud, irons and water in the dark was a hell of a job. Finalizing the veranda (roof) surface with the power trowel and color worked out fine(pic.7-9). Finalizing the inner part of the cistern took us quite some time because all loose parts like wood, mud and nails had to be removed before the water impregnation could start. We used a cement based sealing slurry for drinking water quality, in 3 passes(pic.10-11).